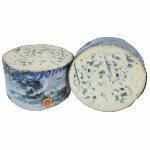 The French gourmet cheese Bleu d'Auvergne has a wonderful aroma, a rich taste; the saltiness increases with the incidence of veining. The overall flavor is piquant but not overly sharp. 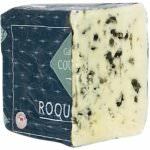 Bleu d'Auvergne started life as an imitation of Roquefort, using cow's milk in place of sheep's milk. Legend has it that a peasant, around 1845, decided to inject his cheese with a blue mold that he found growing on his left-over bread (the motto being, waste not, want not). And thus, the gourmet cheese Bleu d'Auvergne was born. This French gourmet blue cheese comes from the region of Auvergne and the cheese is made from raw milk of Salers and Aubrac cows and is aged over 60 days. 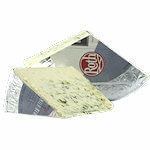 The rind is very thin and so the cheese is usually wrapped in foil. 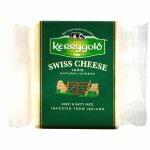 The cheese is rich and creamy with a pale yellow color and scattered holes and well-defined greenish-blue veining. 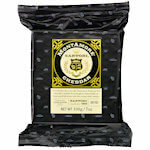 Ingredients: Unpasteurized cow's milk, salt, rennet, lactic cultures, penicillium roqueforti.